Tuesday May 25th 1897 I washed this morning and worked with the chickens awhile after dinner. I was over to Auntys a little while. Wednesday May 26th 1897 Will went to town in the waggon this morning for things we needed. I ironed and in the afternoon mended the clothes and worked out doors some. Thursday May 27th  I was busy about the work all forenoon and after dinner Will and I went up to Ida's and stopped at Nelsons coming home. There was a hard rain last night and it rained before bed time tonight. very warm. Friday May 28th 1897 We took an early start and after stopping in town awhile went up to Danvers where we were invited to dinner. had a very pleasant visit and got home in good time. 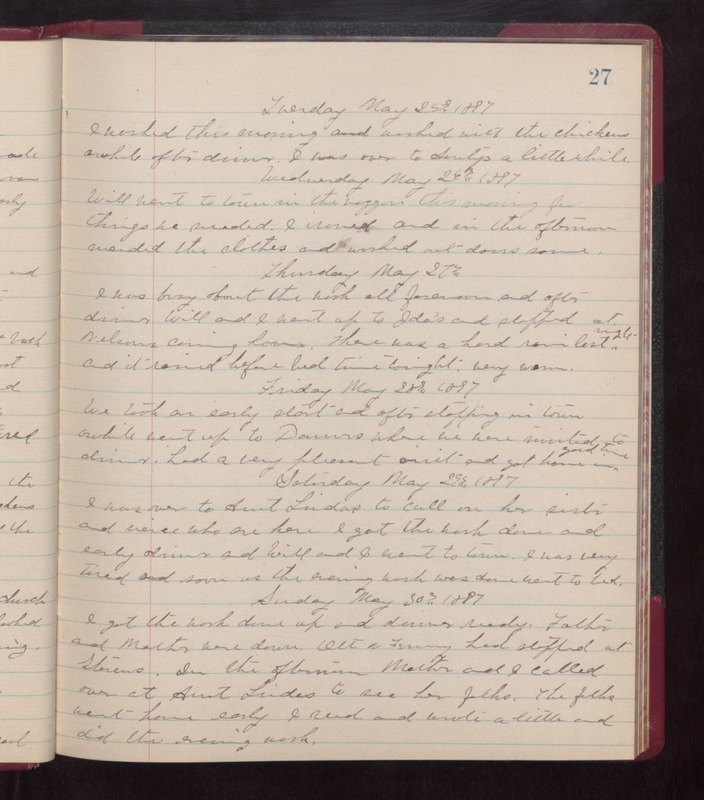 Saturday May 29th 1897 I was over to Aunt Linda's to call on her sister and neice who are here. I got the work done and early dinner and Will and I went to town. I was very tired and soon as the evening work was done went to bed. Sunday May 30th 1897 I got the work done up and dinner ready. Father and Mother were down. Ott & Fanny had stopped at Stevens. In the afternoon Mother and I called over at Aunt Lindas to see her folks. The folks went home early. I read and wrote a little and did the evening work.